Luxury hotel the Taj Lake Palace hotel features 83 rooms and 17 suites. No two rooms are alike and all are adorned with beautiful silks, stunning artwork, ornate carvings and of course offer stunning views of the lake and surrounding country side. 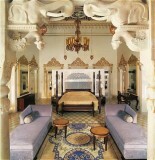 For further information on the luxury accommodation available at the Taj Lake Palace hotel please see the side menu. 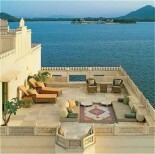 Luxury hotel, The Taj Lake Palace Hotel is located in Lake Pichola in Udaipur in India. Originally built in 1746 by Maharana Jagat Singh, 62nd successor to the royal dynasty of Mewar, this fabulous luxury hotel appears as if it is floating on the calm waters of the lake surrounding it. This iconic hotels setting against the backdrop of the majestic Aravalli Hills on one side of the lake, and regal palaces on the other, and its position in the middle of the lake truly makes it one of the world’s most romantic and unique destinations. Guests lucky enough to be staying at this 250 year old masterpiece are treated like the honored companions of the royal family who first built this as their luxurious summer palace. Beautifully restored pavilions, cusped archways and extravagant guest rooms and suites decorated with ornate glasswork, bohemian crystal lights and intricate miniature paintings remain a testimony to its royal heritage. No expense has been spared to restore this luxury hotel to its original glory and opulent silks, richly colored murals, and ornately carved wood furniture are just a few of the design details that envelope guests in royal mystique. Featuring 83 rooms including 17 luxury suites, the Taj Lake Palace Hotel has a range of accommodation to suit all tastes. As well as an outstanding selection of accommodation the hotel offers guests scenic courtyards with blossoming lawns, lily-filled ponds, gush fountains and indoor spaces filled with period pieces and extravagant embellishments. 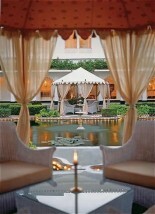 The royal SPA facility has a selection of treatments that will rejuvenate its overworked guests in a matter of hours. 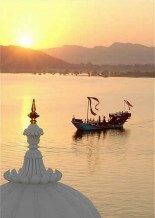 White staying at the Taj Lake Palace Hotel guests should enjoy a private cruise on the hotels 150 year old Royal Barge. After enjoying the view and the unique entertainment over a few cocktails guests will be escorted to a beautifully set table where they will be waited on by chefs in crisp white uniforms serving their gourmet dishes. Over dinner guests can gaze at the floating palace, a dream of white marble and mosaic glistening in the moonlight. Truly a romantic experience not to be missed! Guests choosing the Lake Place hotel come for the experience and history of its unique and ancient heritage. When not just taking in the four acres of grounds and accommodation marveling at the extraordinary architecture and detail that has gone into building and then restoring this palace, guests can chose between a range of other activities available at the hotel. The award winning SPA has a range of world class treatments that are sure to relax even the most stressed out guest. See the side menu for further information on the SPA menu. Guests may also like to relax by the lake side pool, sunbath or relax in a Spa Pool enjoying champagne and strawberries and soaking up the magnificent view. Take a private cruise on the Royal barge, work out in the gym or take a tour in the surrounding area. There are plenty of activities to choose from at the luxury Taj Lake Palace hotel.